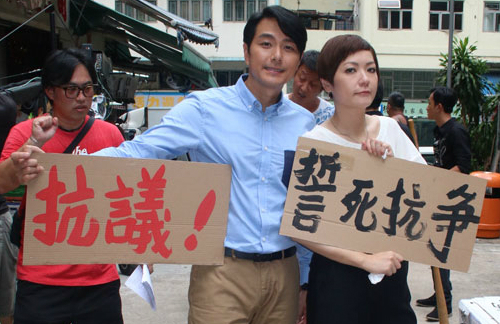 TVB artistes Edwin Siu (蕭正楠) and Kristal Tin (田蕊妮) earlier filmed an outdoors scene for Brothers Keeper 2 <巨輪II>. The scene speaks of Kristal’s grandmother, who is portrayed by Angelina Lo (盧宛茵), protesting against the repossession of her house. Kristal and Edwin lend a hand in the protest, but are greeted by a triad with weapons in their hands. The groups engage in a serious confrontation. Kristal’s husband, Chapman To (杜汶澤), is currently filming his new movie, Time to Eat <開飯喇！>, in Malaysia with Aimee Chan (陳茵媺). Since Chapman and Aimee portray a couple and share a kiss scene in the film, Kristal was asked if she is worried. The 2013 TV Queen laughed and expressed, “Good, that’s right. I’m not worried. Even if they do kiss, it’s because of the storyline.” Kristal added that she has not seen her husband for some time already, because he is always working in Malaysia.